I consider War of Honor to still be in it’s infancy especially as a tournament format. Even for fun play, there are alot of things I feel can easily be exploited. One thing that’s happened to me on several occasions, especially playing an honor or dishonor deck, is that I will have all three players team up and attack me. Then on the next player’s turn, all three players team up and attack me again. Then on the next player’s turn my defense is basically completely worn out and he just comes over and takes as many provinces as he wants. Going from 4 to 0 provinces in one turn is not fun. It’s also very difficult to get military decks to help you defend since all they get is 2 honor and cannot advance their victory condition. I would recommend having rules in place to protect players a little like “A player may only attack or ally to attack another player once until that player gets another turn.” This still allows all players to attack one player but stops them from ganging up on him three times in a row. I’d also be careful about allowing legacy cards in constructed games of War of Honor. Each Arc is pretty balanced but combining two arcs can lead to ridiculous combos. The War of Honor winner at Gencon won by turn 2 with a Celestial/Emperor Enlightenment deck by dropping one ring on each player’s turn. In a game as complex as L5R, when you start to add in more than one opponent, the turn sequence can bog down to a crawl if one adheres strictly to the play or pass gameplay. The easiest way my local group has found to deal with this, and thus speed up the game a bit, is by announcing at the start of each player’s Action phase that you might have an action you might want to take, and essentially skipping any other players who do not. This works for Attack phases as well, even more so, since the game’s rules themselves keep players without Units at the battlefield from being able to affect those battles. That brings me to another play aid my locals have started employing, the Daimyo’s Chop. Basically like the Dealer Button in poker, the Chop is any small object that can be passed to the player when it is their turn. This will allow gameplay to quickly return to it’s normal procedure after a large and drawn out Attack Phase, where who’s turn it is can easily be forgotten or confused. 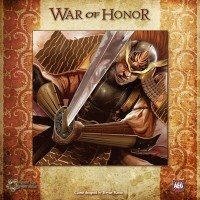 1)Since this game can be a little complex for those not familiar with L5R, I suggest allocating a couple of hours for this game at first until you get familiar with it. 2)I’ve found it useful to say “Your action” rather than “Your turn” since players take actions during everyones’ turn. 3)Due to space limitations + tiles on table, have your personalities to the right, around/near/above your Fate deck, (called Home) and when they assign to attack, just move them in front of your own provinces and specify which of opponents provinces you’re attacking. He(Defender) can also just slide said province cards forward a bit for memory aid. Allies can add their units on your side too for visual aid. And 4)This game is funnest with more players (ie.4)Especially since there are cards in the deck that are ally specific, so you won’t get the full use of the cards and therefore the game itself. This is an odd one, but how honor/dishonor works in the base game makes them pretty un-interactive. We’ve found this works well oftentimes to make dishonor ‘global’ and honor ‘negate’ dishonor globaly as well(based on the largest gains/losses from any one player. When constructing your fate deck, try not to go heavy with Limited actions, as they are only used on your turn. Strategy cards with Open/Battle/Reactions are suggested to help grind victory conditions on opposing players turns. We play large group games with War of Honor and the last two players seem to get screwed early so we’ve tried having a few turns of no attacking so people can build up a little defense two turns didn’t seem to be quite enough we have yet to get back to try three.